Dec. 3, 2018—Next time you're at the airport, here's a good way to spend your time: Learn how to save a life at a CPR training kiosk. These kiosks demonstrate—in only minutes—how to perform hands-only CPR. And they're popping up in more and more public places, like airports. Now a new study reveals they're about as effective at teaching people how to save lives as more time-consuming CPR classes. The study looked at three different ways of teaching CPR: a kiosk session with a manikin, a class with a facilitator and a video-only session. It involved 738 participants. Researchers found that people who took part in a four-minute kiosk training session were able to do hands-only CPR about as well as those who took a 30-minute class. And both groups were much better at CPR than those who only watched a video. The take-home message: For a person with little or no medical training, these kiosks can teach lifesaving skills in just minutes, researchers said. 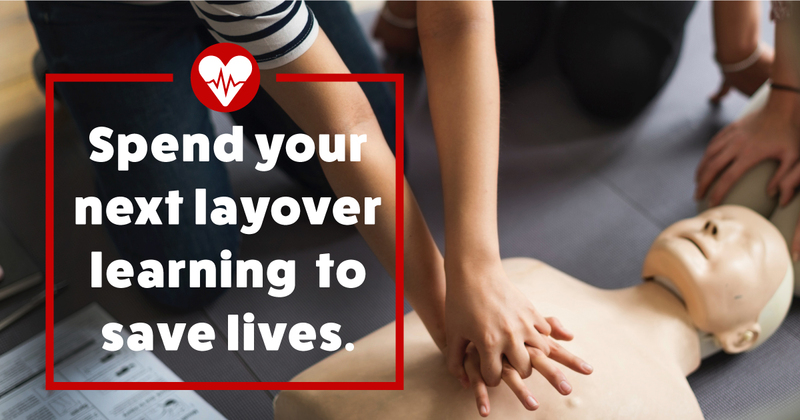 CPR administered right away can double or triple a person's chances of surviving cardiac arrest. But fewer than half of people who experience cardiac arrest outside a hospital receive CPR from a bystander. A key reason: Bystanders may hesitate to help because they don't know how. This study may help change that, since one barrier to training is the time it takes, the researchers said. 2. Place the heel of one hand on the center of the chest. 3. Place the heel of your other hand on top of the first hand, then lace your fingers together. 4. Position your body so your shoulders are directly over your hands. Keep your arms straight. 5. Push hard, push fast. Do compressions that are at least 2 inches deep. Give them at a rate of at least 100 per minute—about the speed of a disco or dance track. Let the chest rise completely between them. You see obvious signs of life (like breathing). A trained responder can take over for you. You're too exhausted to push any more.